LOCATION: Hot, dry sites in full sun or in pots. PLANTING: Seed in the spring or transplants anytime. FINAL SPACING: One is enough. BLOOM/FRUIT: Greenish-white flowers followed by berries similar to black pepper. It is dioecious so male and female plants must be present for fruit to develope. GROWTH HABITS/CULTURE: Small tropical tree native to south America and W. Indies. It is evergreen and has aromatic bark, leaves, berries, and bunches of flowers. Glossy foliage. PROBLEMS: It will freeze in the winter except in tropical areas or with careful protection. HARVEST/STORAGE: Berries are gathered when mature but still green and dried for use. CULINARY USES: Allspice is used to flavor food, especially to sweeten dishes with its peppery taste. MEDICINAL USES: It is used as a warming medicine given as a tea for chills and flatulence. LANDSCAPE USES: Greenhouse or container plant. OTHER USES: Berries are eaten as a breath sweetener. 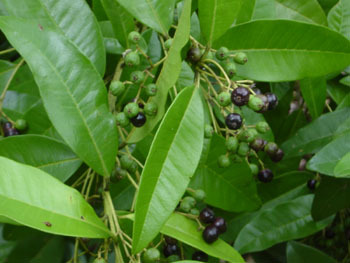 Leaves and berries are used to make oil for cosmetics. INSIGHT: Seeds are now available from specialty seed companies. Dried allspice seed in the grocery store has probably been heat-treated and will not be viable. Can only be grown in pots in the summer anywhere, in tropical regions and in greenhouses.